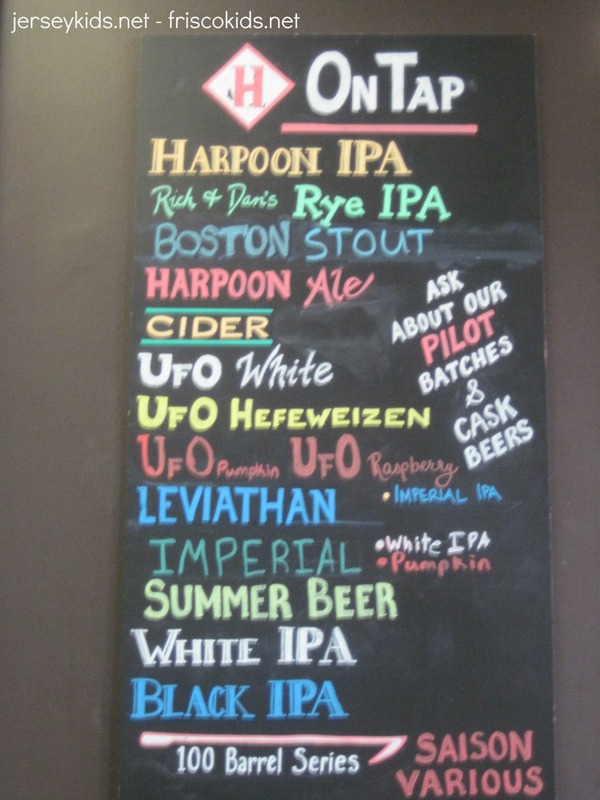 After touring the Sam Adams brewery in Boston (review here), I heard about Harpoon Brewery, another local stop. Fortunately for me, it was just down the street from the Seaport Hotel where we were staying in the trendy Seaport area. This time I did not go and drink alone, but rather went with my husband who had just finished a week-long course on immunology, and clearly needed a very big beer. By the way, this is part of our Boston series. 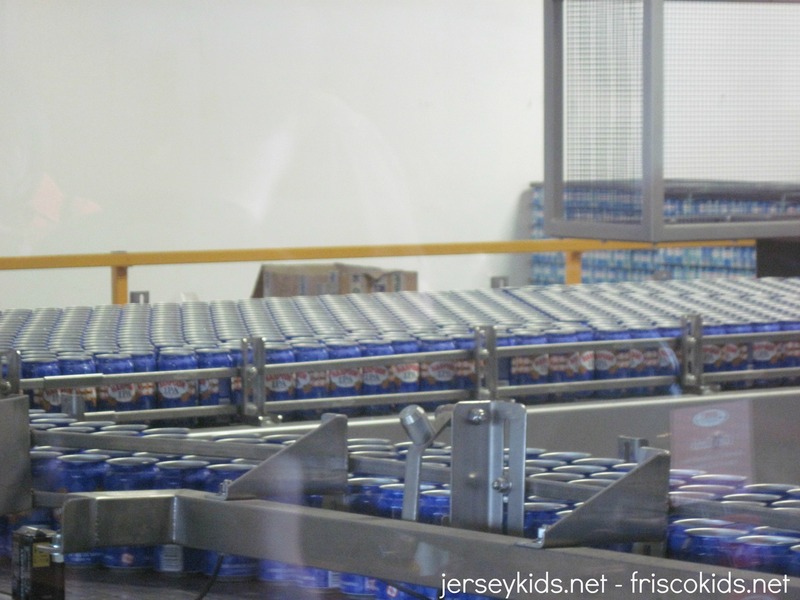 **And if you like factory tours, check out our post on Bay Area factory tours, which includes local brewery Anchor Steam! 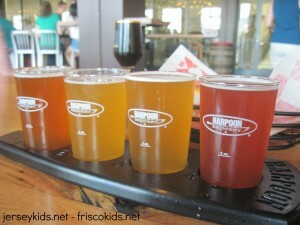 The plan was to take a tour of Harpoon, hang out in their brew pub and then head to the airport a few hours later. Unfortunately, we arrived around 1:30, but the tours were already sold out until 4:30 or later (a common occurrence apparently). Oh well. Fortunately they had a very large bar and rows of long wooden farm tables to park ourselves, though the waitress kept walking right past us (or not at all - it WAS busy and a Friday afternoon) that I finally had to go to the bar to order from there. and then get into the bar area. You can read all about the brewing process here. This would have been a good primer to read before going on the Sam Adams tour. 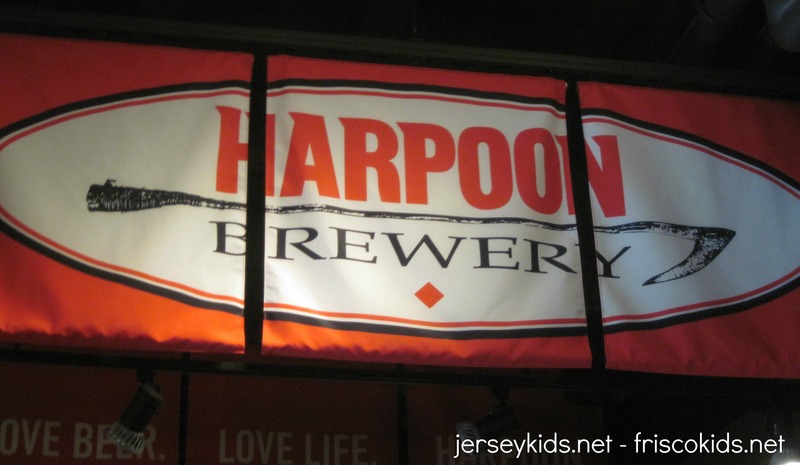 While Harpoon sells kegs and bottles (read about bottling here), we saw their canning area from the bar/entrance, where large windows let you peer in. Of course thoughts of Lucy and Ethyl crossed our minds, especially seeing empty cans on the floor. I did see one employee drinking on the job - though I believe it was coffee from Dunkin' Donuts. 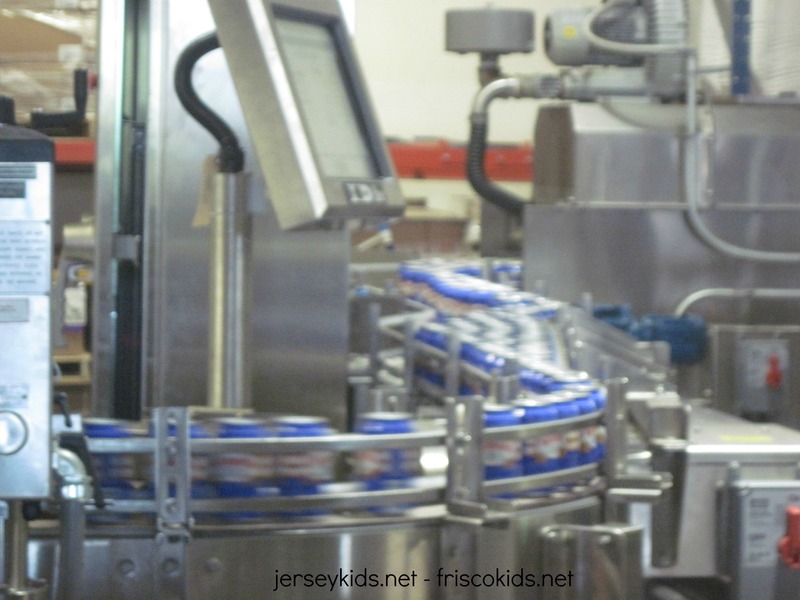 We saw the cans winnowed down from the mass you see above, to single rows, where they made their way through turning contraptions into the machine that poured the beer, and then put a lid on it. Pictures I got of that were fuzzy. 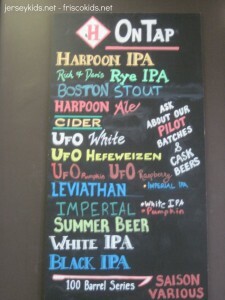 Here's what they had on tap (picture below). They offered four different flights, including IPAs, the UFO flight (unfiltered light beers, some with fruit), saisons (French style beers that were creamy and fruity), and I can't recall what the other flights were. The taps for each flight were adjacent to each other, and it was great fun watching the bartender pour a flight. The four glasses are on a board (see the second picture below), and he lined them up under the tap, tilting the board and clicking each of the four taps on - 1, 2, 3, 4 and then off in the same order. It was an art. 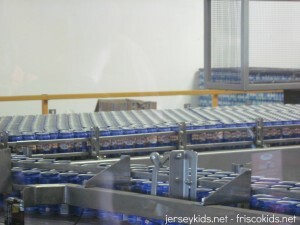 In the background below you can see the canning part of the factory behind the glass. Below is the UFO flight. There's are pumpkin and raspberry beers in there. Since our waitress was so slow I ordered from the bar (that took awhile as well - it was very busy and I guess my shirt wasn't low cut enough). I gained a new respect for the wait staff in carrying this flight back to the table - it was hard! 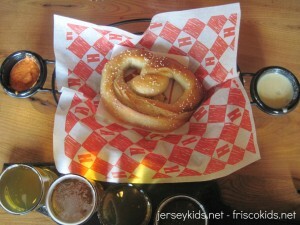 Harpoon makes its own pretzels - you can see making and baking them close to the bar, in what looked like pizza ovens. You have a choice of eight different dips (you choose two), including a red pepper aioli, spicy ale mustard, olive oil and parmesan, and some others I can't remember. They were delicious. The tables are communal - you can see the random people we sat with. It's a decently large size room, with probably 3-4 rows of these tables - you can see how far down it goes. That plus the really large bar means a loud room. You can hang out in there while you wait for your tour. We hit the gift shop at the end - a selection of clothing, beer and accessories. We opted for the UFO glass, which has a funky shape and my son had adopted it as his glass in our kitchen. 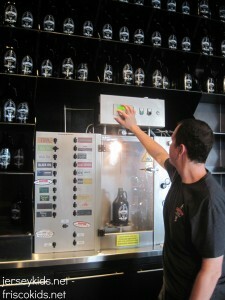 We had fun watching the guy fill the growler up (photo below). 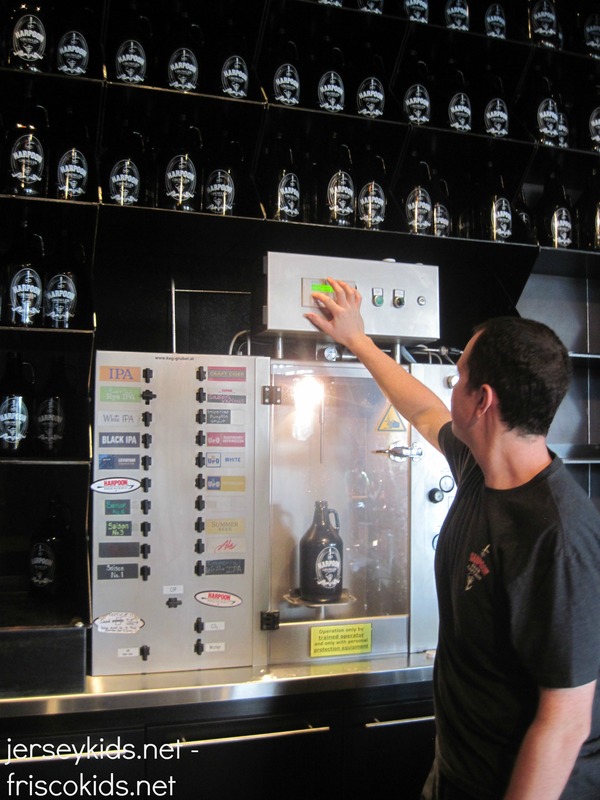 The growler is raised by the contraption it sits on, with a long tube extending into the growler to fill it. 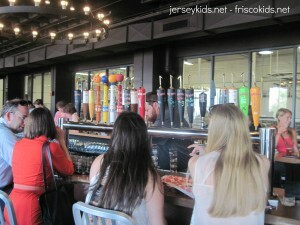 Lots of beer options, as you can see on the left. Where: 306 Northern Avenue, Boston; there's some parking near there, or take the silver line (SL2) to the stop just outside the brewery itself. Details on transportation here. It's about a 30 minute walk from the South station (red line). When: Click here for the daily schedule for the Harpoon Brewery tours - click on the day you want on the calendar. 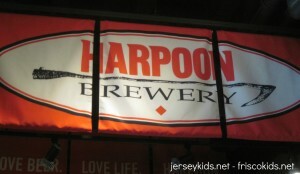 Harpoon tours are daily, from around 11:30-6 depending on the day, they last about an hour, leaving every 30 minutes. 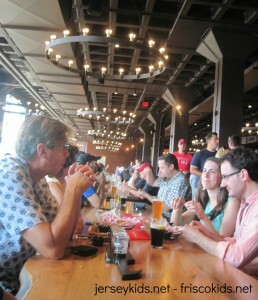 If you don't take a tour, you can enjoy the beer and pretzels Monday to Friday from 11-7 or 11-11. 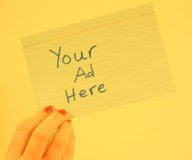 Click above for the schedule. Cost: $5/person, includes tour and tastings for those 21+. 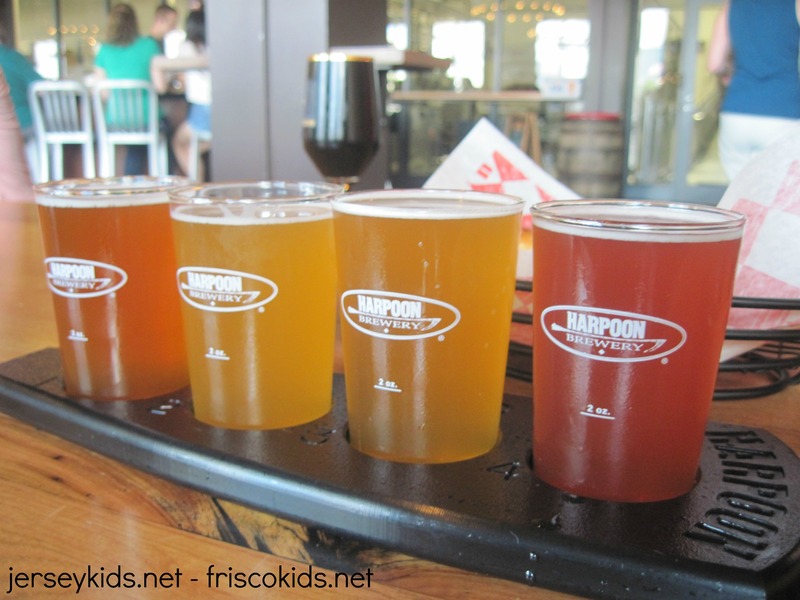 Kids: I didn't see any kids there (mine were there either), but I believe they're welcome on the tour, but not to do any tasting. Duh!